Competition can have its downside but there appears to be only silver linings and no clouds involved in the Great Canadian Food Fight, which pits Victoria’s Mustard Seed Food Bank against those of two other cities to see who can raise the most food over a two-day period in October. Mustard Seed director Brent Palmer says the contest isn’t so much between the food banks as between the people of Victoria, Regina and Halifax and there won’t be any losers because the media, both for-profit and non-profit organizations and lots of individuals are seizing on the event to generate food for those in need. The contest runs from October 14 at 6 pm to the same hour on October 16, which is World Hunger Day. The Mustard Seed began small, as a praying bench tucked into a closet at small businessman Gipp Forster’s T-shirt store in downtown Victoria. Forster went on to become a Baptist minister and columnist while his informal, one-closet ministry became a vibrant street church and food bank, which also runs a faith-based therapeutic community for recovering addicts at the Hope Farm in the Cowichan Valley. At the farm there is also a 10,000 square-foot food storage warehouse that distributes food to local banks up and down Vancouver Island, a sizeable proportion of which comes from larger population centres such as Toronto when they have surpluses. 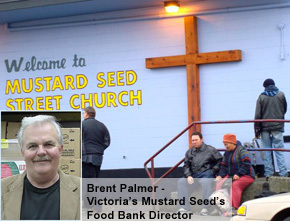 The Mustard Seed also helps 18 other agencies in Victoria that provide food for the needy. Especially perishable food gets quickly moved to organizations providing meals. This is Victoria’s second year to face off against Regina, though it is Halifax’s first. Last year Victoria raised 103 tons of food against the Prairie capital’s 173 tons. The Victoria bank also raised $50,000 cash, which Palmer says should translate into $150,000 worth of donated food because Canada’s food banks pool their buying power. And when they buy in bulk, the food chains often throw in a lot of product near its expiration date for free. Steve Weatherbe blogs at faithvictoria.wordpress.com.